It's been said virtual reality might be the ultimate empathy machine, allowing people to see through the eyes of others and better understand their struggles. 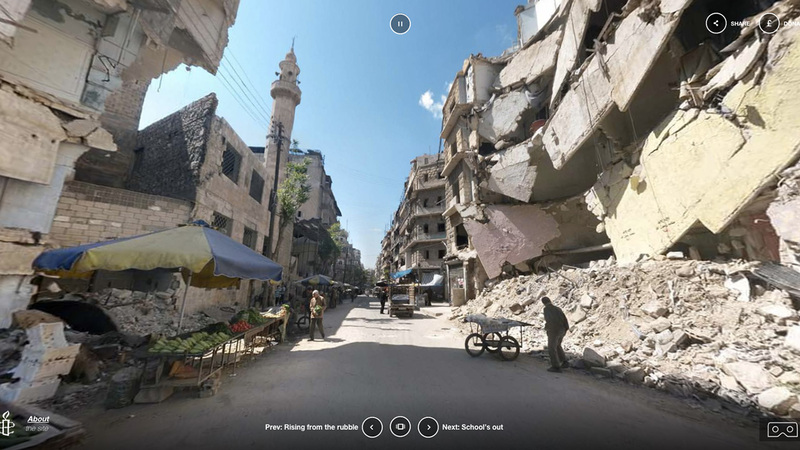 A new campaign by Amnesty International U.K. and San Francisco design and technology agency Junior visits a people and place most in need of that empathy—in a stunning VR experience showing the effects of the Syrian government's barrel bombing of its own country. The website 360Syria.com went live overnight and features a self-guided VR tour (viewable on the web or on VR headsets) that shows the stunning devastation in the city of Aleppo and elsewhere. Amnesty and Junior created the campaign with a group of Syrian media activists from Aleppo called Lamba Media Production. The experience, titled "Fear of the Sky," makes brilliant use of 360-degree photography, narration, sound recordings, WebGL 3-D graphics and videos to show the lived reality on the ground where these bombs have fallen. Featured scenes include a school playground in the residential neighborhood of Ansari Sharqi and a vegetable market in Aleppo's Bustan al-Qasr district. The narration is unspacing in its assessment of the bombings as an atrocity and a war crime. "If a picture is worth a thousand words, then a virtual reality experience is worth a whole book," said Amnesty International U.K. director Kate Allen. "Many of us might think we know what's been happening with the Syrian government's barrel bombing of places like Aleppo, but viewing these apocalyptic scenes from 360-degrees provides a new level of understanding." "VR is the next frontier of mass digital experience, but the applications and cost of the gear are too far out of reach for all but the most technically savvy audiences," added Robbie Whiting, co-founder of Junior, a Project: WorldWide agency. "WebVR is a great democratizing force enabling any user with any device to have a fully immersive experience, headset or not." This is hardly the first use of VR to illuminate the Syrian tragedy. (The United Nations and ABC News are among the organizations that have done VR recording there.) Nor is it Amnesty's first VR experiment in the country. The group has been using VR headsets on the streets of England since last year to show people 360-degree views of what's actually happening in Syria—part of a street fundraising campaign the nonprofit says has been very successful. The 360 Syria campaign, though, will reach vastly more people, particularly since it's optimized for web as well as VR headsets. It's also incredibly well crafted, with easily navigated sections and content curated and organized for clarity, not volume. "The devastation in Syria is heartbreaking," said Zac Rolland, technology lead at Junior. "Our challenge was to find the most compelling and accessible way for technology to help the world understand and experience what is happening on the ground. WebVR does just that."